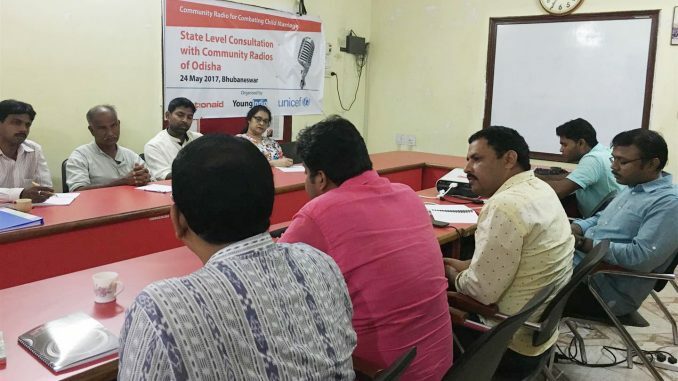 Bhubaneswar: Community radio stations can play vital role in ending social issues like child marriage, said child right experts and community radio promoters of Odisha. The opinion came at a state level consultation programme organized jointly by renowned non-profit Young India and the Odisha chapters of ActionAid and Unicef today at Bhubaneswar. Explaining the gravity of the issue of child marriage in India, Unicef’s child right expert Lakshmi Narayan Nanda highlighted the data provided in the recent National Family Health Survey (NFSH-4) and explained various reasons behind the practice of child marriage in the state. While explaining the engagement of community radio stations in creating awareness in the communities, Sishir Kumar Das of Daspalla based “Radio Suravi” brought to fore how his radio programme “Suna Jhia (Golden Girl)” has brought awareness among the parents to feel proud of having a daughter than counting a girl Child as a burden. Stressing upon the fact that education of girls can help ending child marriage in the society, community media specialist N A Shah Ansari, Chairperson of Radio Namaskar highlighted the programmes produced by the station crew to promote girls’ education and facilitate re-schooling of the drop-out girls. Ansari also urged for capacity building of persons engaged in production of community radio programmes. Effecting communication at the community level can achieve bigger success in preventing child marriage, said Ghasiram Panda, communication head of ActionAid. He also explained how to access data on child marriage and related subjects to add value to the radio content. While suggestions like creation of common as well as station specific contents on child marriage was well taken by both experts and participants, Lakshmi Narayan Nanda of Unicef proposed for production of programmes and contents in collaboration with district child protection units (DCPU). Realising the gravity of the issue and its direct link with IMR and MMR, Community Radio Station promoters agreed to make the issue integral to their objective of bringing change in the society. Participants from more than 12 functional community radios of Odisha attended this consultation and planned to march forward with the said issues for year long.